Home » Blog » Picks » Are Streakers Wise? If you visited this blog post expecting animated gifs of streakers getting tackled at sporting events, then you’re at the wrong place. No, this is not a discussion of people interrupting sporting events for 15 seconds of fame. Instead, we will be discussing crowd wisdom as it relates to making picks in sports props. The concept of crowd wisdom (see Wikipedia entry) was presented to me last year as I was talking with some folks about building a fantasy football polling app. If you didn’t click the previous link, the basic idea is that the wisdom from a group of individuals can often exceed that of expert opinion. Suppose ESPN Streakers are the crowd and Streak Edge is the expert. Does crowd wisdom outperform expert analysis? We are unable to collect how many people make picks on each prop, although I admit that would be useful information to consider. We provided picks for 979 props in May and June combined. 821 were 1 or 2 star rating versus 158 rated as 3 star or higher (our recommended picks). The crowd agreed with Streak Edge on 717 (73%) of those picks. 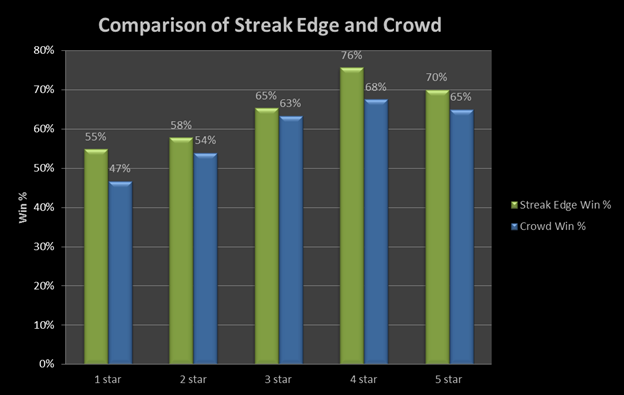 Streak Edge had an overall winning percentage of around 58% versus 52% for the crowd. See the breakdown of these percentages using our ratings system in the graphic below. So we have shown the crowd wisdom does not exceed that of the expert (at least for May and June), but how is this useful? In order for there to be a discrepancy in winning percentage between Streak Edge and the crowd, there must be a discrepancy in picks. Let’s look at just the picks where we differed from the crowd. My findings are illustrated in the graphic below. Here we see a much bigger gap than above. Of course, if Streak Edge and the crowd are picking the same over 70-75% of the time, the difference in winning percentage must be in the remaining 25-30%. What I did not expect to find, was that our winning percentage on even 1 or 2 star picks was at a level much higher than expected. So what does this mean? 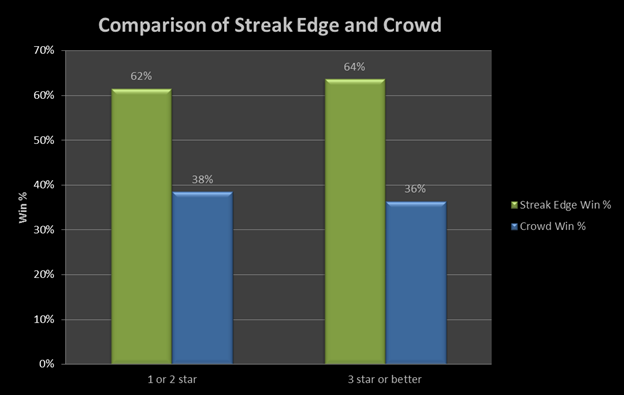 If you use Streak Edge picks, you are likely to perform better than just following the crowd on any given pick. If you disagree with one of our picks, then the data suggest that changing your pick to match ours will increase your odds of winning from under 40% to above 60%. That’s over a 50% increase in your chances of picking correctly! And if you agree with one of our picks, then the data suggest you probably are making the right choice to maximize your chances of keeping your streak alive. Furthermore, the data in the second graphic suggest that even 1 or 2 star picks where we disagree with the crowd are winning at a rate similar to 3 star or higher picks. Although, we will not rate these picks higher, you should use this to your advantage when making your own selections. As noted before, if you see a discrepancy between Streak Edge and your fellow Streakers, take that as your cue to consider that prop. We hope you continue to take advantage of the information we provide. Until next time, keep on streaking! Hugh is an independent statistical consultant and founder of Eligis Analytics. His love for sports statistics started at a young age when he would read player stats on the back of baseball cards.